Weather has dominated the river week. 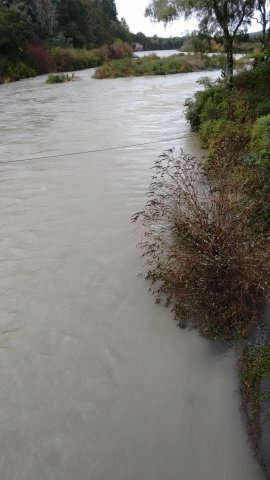 As I completed Advocate 5/15 the rain started (Wellington’s flood weekend) and Friday saw the river rise again in another small flood reaching 305 (cubic meters per second) cumecs. A river of the size fills the river from bank to bank as in these photos looking North and South from the Major Jones bridge. 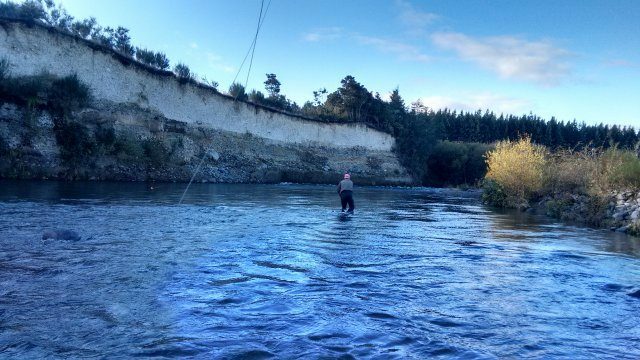 The rain stopped on Friday evening but the flow remained above 40 cumecs for daylight hours on Saturday and on Sunday still had colour and the flow was still close to 40 cumecs. The graph taken from the Genesis website (Genesis Energy Tongariro River flow) is for 7 days. The river in normal flow is about 22 cumecs. Today we have again had rain and the two day graph shows a minor increase in flow not shown in this 7 day graph, to 29 cumecs at 11.00 pm. Saturday afternoon and the river was fishable, though I observed a couple of anglers fishing the river on Friday morning when it was high and dirty. They must have been passing through and took the opportunity to chance their luck. Saturday afternoon onwards was good fishing. I fished the Cicada Pool, For me there is much pleasure in the beauty of the river environment. Monday morning saw a -3 degree start and Tuesday 0 degrees. 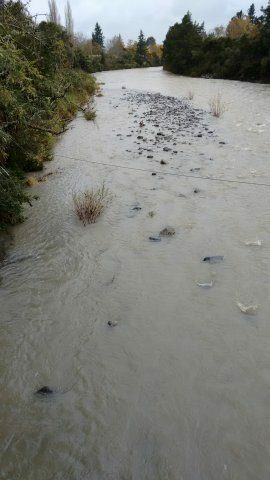 Tuesday and Wednesday had very strong winds which had a rotten tree fall across the Tongariro River Trail on Tuesday on the true right just north of the Red Hut bridge. For me today has been a good day to tidy up the Autumn leaves before the next wind and rain but most of the Autumn leaf fall is now over. The poisoned wilding pines are at an advanced stage of decay. 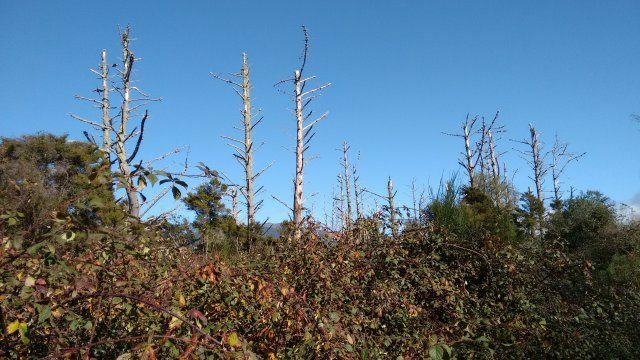 These are some of the first trees poisoned. I had interesting feedback on the Blue Ducks that I wrote about last report. The Major Jones it was reported to me had 10 Whio the day after my sighting and they were not the slighest bit concerned about the anglers fishing the pool. Anoher angler reported 6 Whio in the Breakfast Pool keeping him company as he fished the pool. On Tuesday on my Bike ride around the Tongariro River Trail there were 3 under the Red Hut Swing Bridge. As I fished the Cicada Pool during the week there were a couple of Whio each day. 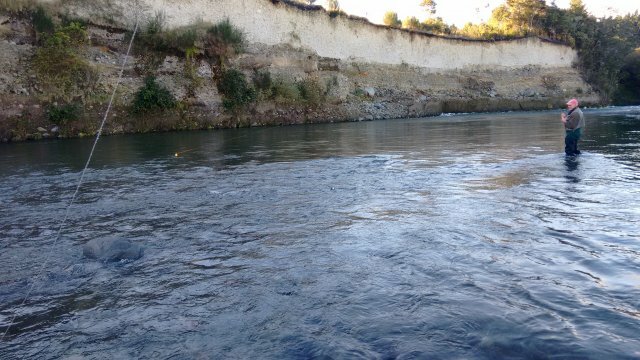 Mike Nicholson told me that only 4 Whio had been released from the National Trout Centre Whio rearing enclosure which would indicate a good breeding time on the river. New Signage to go in around the river. I met with Dave Lumley and Amelia Willis of DOC to discuss the new signage to replace existing photo signs and improve other signage on the Tongariro River Trail. This process will take a little time but should be evident not too far away.